(Portland, Oregon) – It's a landmark that's been around for 80 years, but it might as well have been from another, parallel dimension earlier this week, the way it looked in the fog of an early November storm. Indeed, it lived up to some of the paranormal rumors the area has built up over the years. 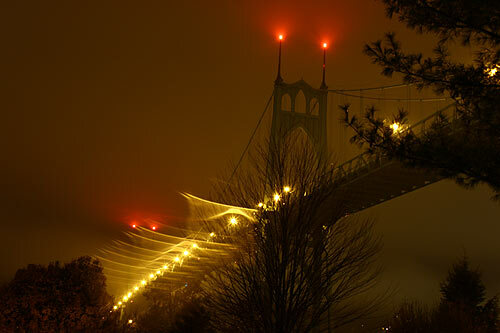 A thick fog enveloped much of Portland this weekend, and in the St. Johns district, this fog created a bridge that resembled something from the afterlife. The lights of the bridge were a blurry mass that seemed to come to life – a very different life form. 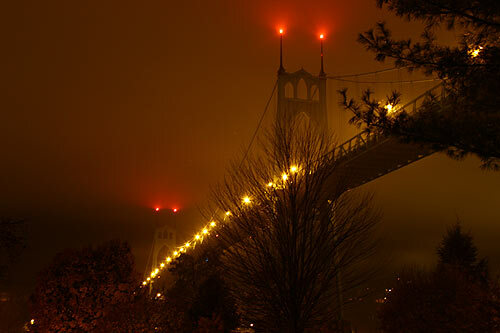 As the far end of the bridge itself seemed to disappear into a paranormal kind of nothingness, the red lights at the top shot out in angular streams skyward. The yellow lamps that line the side of the bridge became more like Christmas lights, offsetting this creepy mood. Meanwhile, the bright colors of autumnal trees are still visible, even in the dark of night. 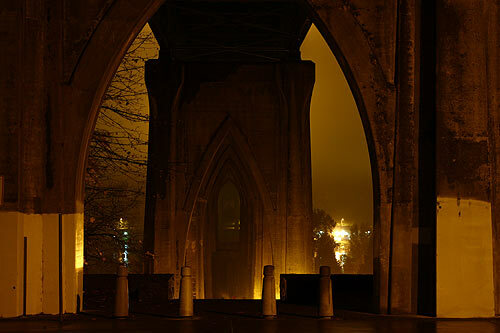 It’s distinctly weird, beautiful and even eerie at the same time, a perfect match for the legends of a hollering ghost at Cathedral Park just below the bridge. Supposedly, this ghost wails in foggy nights, but no such otherworldly contact was heard this night. Beneath the bridge is the only way to keep away from the rain. Water from the sky quickly hits the lens of the camera, and the resulting effect is again even more otherworldly: it’s as if chunks of the disciplines of quantum physics and string theory come to fruition, and the camera catches some inter-dimensional bending of time and space. Alas, it’s only a lens aberration. But underneath the bridge, things get interesting again. Its Gothic underside more than slightly resembles a cathedral in these foggy, weird conditions. This St. Johns landmark is a tourism hotspot for many traveling through the region. The bridge was finished in 1931, replacing the last ferry for the Portland area. It was named for the neighborhood of St. Johns, which itself was named after a settler who began the local ferry system nearly one hundred years before - James John. At its construction, it was known as the longest suspension bridge west of the Mississippi, designed with Gothic arch towers and steel frame piers that were also inspired by Gothic architecture. It was designed by a New Yorker by the name of David B. Steinman, who passed away in 1960. This bridge was always one of his favorite creations, he said throughout his life.